A 28-year-old man has been sentenced to 20 years in prison after he was convicted of providing material support to the Islamic State of Iraq and Syria (ISIS), the Justice Department said Friday. Mohamad Jamal Khweis from Alexandria, Virginia, was convicted by a federal jury in June. The Justice Department said Khweis left the U.S. in 2015 and eventually crossed into Syria through Turkey late that year. 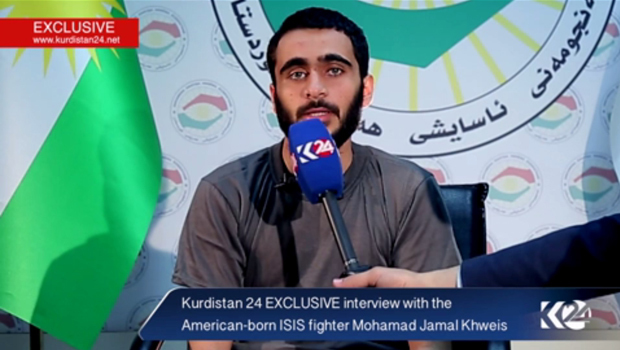 Khweis spent 2.5 months as a member of ISIS in northern Syria. In 2016, he surrendered to Kurdish forces in northern Iraq and was eventually turned over to U.S. authorities, the department said. "The evidence at trial demonstrated that Mohamad Khweis is an unpredictable and dangerous person who was radicalized towards violent jihad," said Dana J. Boente, the acting assistant attorney general for national security and U.S. Attorney for the Eastern District of Virginia. The department said Khweis used encrypted devices and mobile applications to hide his activity. After joining the militant group, he agreed to be a suicide bomber, prosecutors said. "Khweis purposefully traveled overseas with the intent to join ISIS in support of the terrorist group's efforts to conduct operations and execute attacks to further their radical ideology," said Andrew Vale, the assistant director in charge at the FBI's Washington field office. "Khweis recognized that ISIS uses violence in its expansion of its caliphate and he committed to serving as a suicide bomber." Khweis is among a handful of Americans who have joined the terrorist group and made it out alive. "I didn't agree with their ideology," Khweis said in an interview with Kurdistan24 in 2016. "Our daily life was basically prayer, eating, and learning about the religion for about eight hours." Kweis graduated from Alexandria's Thomas Edison High School in 2007, where friends described him as "one of the guys." "He wasn't someone who was an outcast or something like that -- he was one of the guys," Harrison Weinhold told CBS News in March 2016. "There wasn't anything that would lead me to believe that this was, like, on the radar, that he was just going to go join ISIS."